12'' x 24'' sheets of 1/8'' MDF, perfect for crafting or laser work by Wood It Is at HoldUp Art. Hurry! Limited time offer. Offer valid only while supplies last. 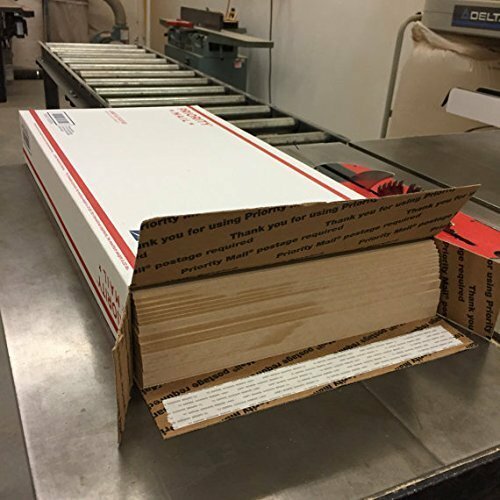 You asked for it - here it is - a GINORMOUS box of 1/8'' MDF (that's 3 MM for anyone into metric measurements) packed into a Large Flat Rate USPS box. You asked for it - here it is - a GINORMOUS box of 1/8" MDF (that's 3 MM for anyone into metric measurements) packed into a Large Flat Rate USPS box. This box contains 24 sheets of MDF, each one measures just under 12" x 24", so that it can fit into this USPS Flat Rate shipping box - the one that is made for mailing board games. I'm guesstimating that each sheet weighs about 2 pounds, so this is a hefty box to ship. Do you make small signs or plaques, or perhaps teach a tole painting class? CNC work or laser cutting? These would be excellent for perfecting your skills! Or - these would be great for mixed media crafting projects, too. Doll house building? Laser engraving? Materials for home-schooled projects? Perfect!